The Grammys audience was shocked to see Hillary Clinton pop up as the final participant to James Corden’s Fire and Fury sketch, and, on some level, so was Corden himself. As the host explained on The Late Late Show Monday night, he had to lie his way through the filming process because he wasn’t sure if his wild card player would agree to appear. 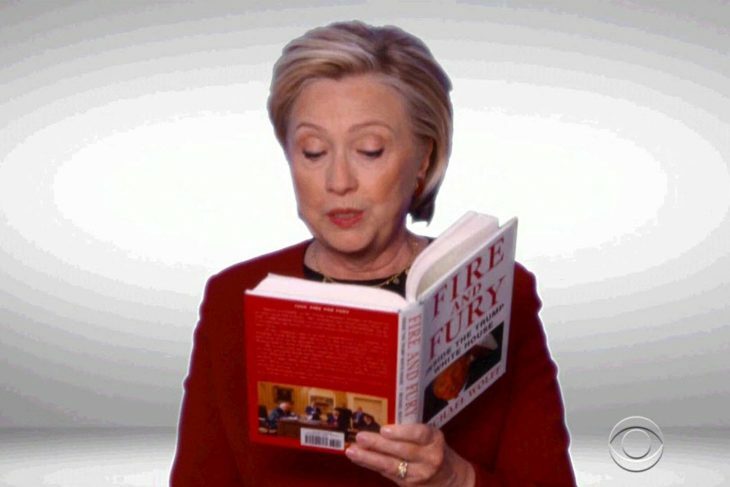 The sketch saw John Legend, Cardi B, Cher, DJ Khaled, and Snoop Dogg reading excerpts from Michael Wolff’s Fire and Fury: Inside the Trump White House — the same book that called the president’s mental stability into question, that included damning quotes from former chief strategist Steve Bannon, and that claimed Trump had a nightly ritual with a cheeseburger. All the celebs had agreed to participate under the assumption Clinton was also involved. Though, at the time, that wasn’t guaranteed. Fortunately for Corden, Clinton ultimately said yes. “That is not a call I want to make to Cher,” he joked.